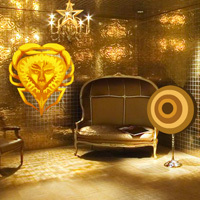 Wow Golden Medallion House Escape is another point & click escape game developed by WowEscape. In this game, you came to see the beauty of a golden medallion house. But unfortunately, you are trapped inside the house. You have to find the way to escape by finding useful objects, hints and by solving puzzles. Click on the objects to interact with and solve puzzles. Good luck and have fun! So I'm through the second door and only have what looks like a gold coconut in its husk. Can't figure out what else to do. Done! Hardest part - the gold bows hiding in the gold scrunched up paper and watch the eyes of the masks. your least favorite insect and a pun together? I'm just not getting the ball, check, "c" clue. I assume it's for spelling out the letters, but I'm at a loss as to what. ah, clue for pipes was visible before you rub it with something. That's why clue was not working for me. ipi - I had to double check to make sure the blue part of the pipe was facing in the direction of the clue.